Most recognized athlete of ALL TIME & one of the most admired by not just the U.S. but the World. I can't remember when I gave up on boxing, as it was so long ago. But I loved watching Ali. Ali is an inspiration. Look at the power in that picture! Are you going to be with H&F tues on Breakfast Television for their big announcement. Wow how times have changed in professional sports. Not one logo to be seen. I have watched that clip over and over and over but not for a few years. This is the 'Phantom Punch' clip. Where it appears Ali completely missed him and the fight was thrown. But the thing is that Ali was so fast he did hit him. 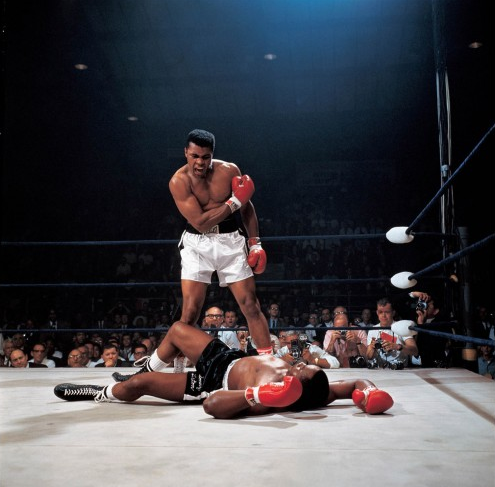 The punch that missed was when Liston was going down. Or so my memory recalls.